The Membrane Flush/Flow restrictor valve is an all in one flow restrictor equipped with a flush valve for easy worry free use. 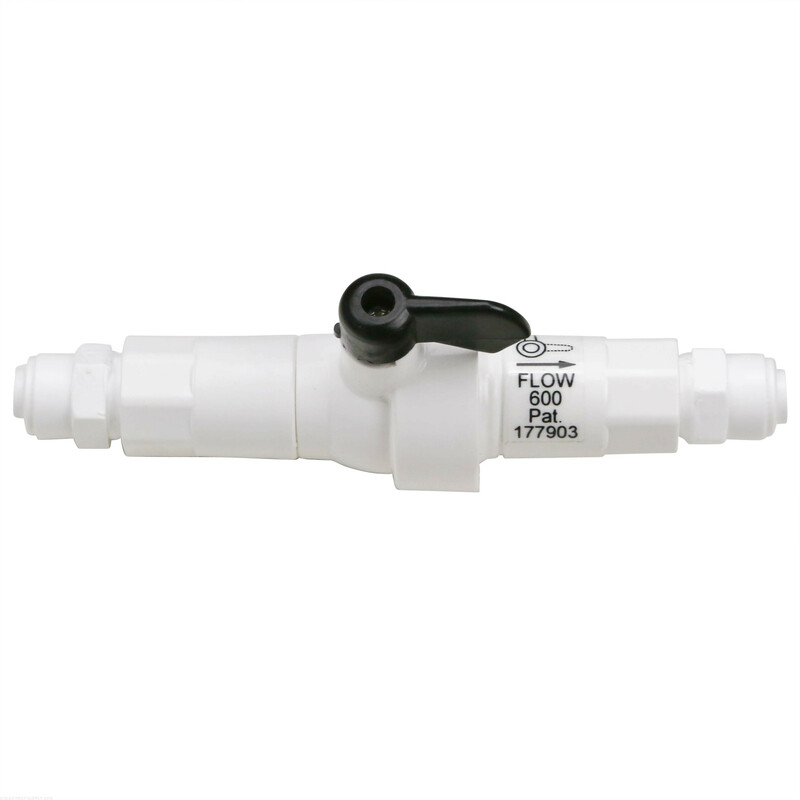 Keeping the flush and flow restrictor in a single package keeps fitting count down which means less chance for possible leaks or failures down the line. 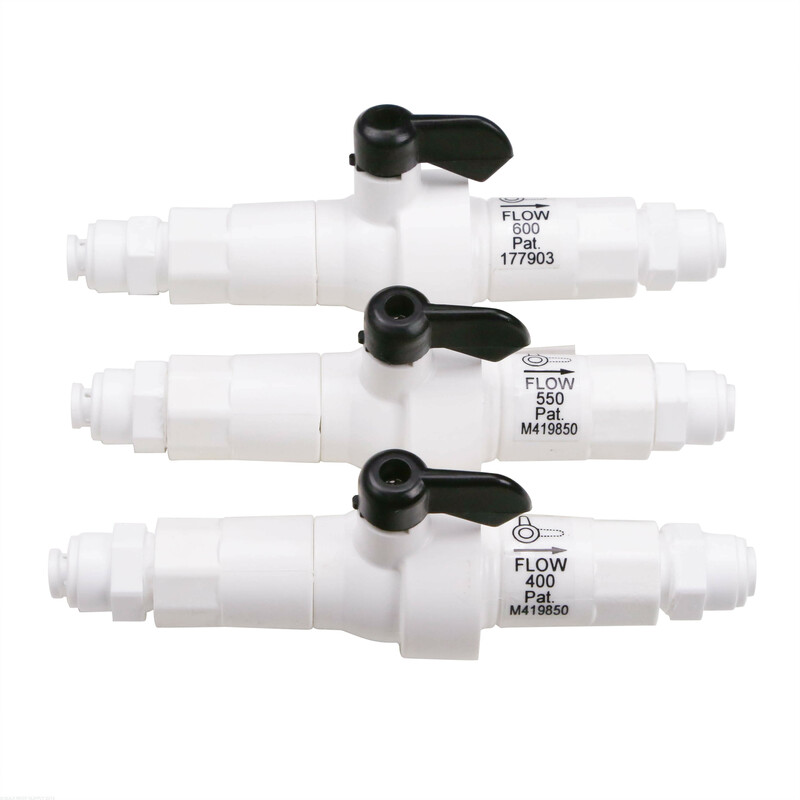 Reverse Osmosis membrane flush/flow restrictor valves increase the flow to the membrane by bypassing the flow restrictor when the valve is opened. This helps flush deposits and significantly increases the usable life of the RO membrane. The Membrane Flush/Flow restrictor valve is an all in one flow restrictor equipped with a flush valve for easy worry free use. Keeping the flush and flow restrictor in a single package keeps fitting count down which means less chance for possible leaks or failures down the line. BulkReefSupply.com recommends flushing the membrane before and after each use for a few seconds, or every few weeks for a few minutes as part of regular reverse osmosis system maintenance. 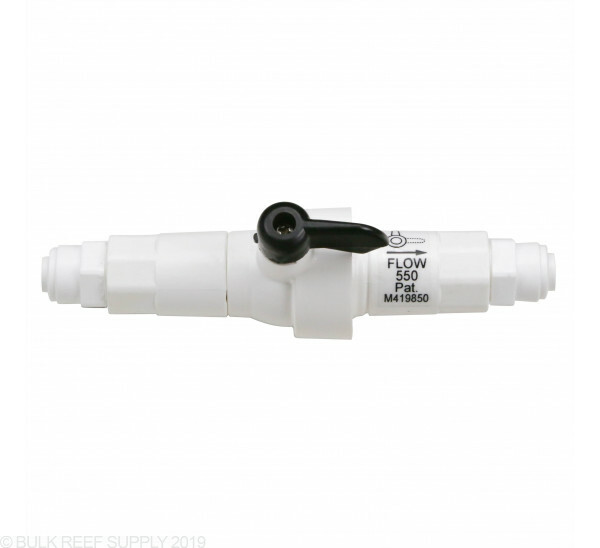 When the handle on the valve is “in line” the valve is bypassing the flow restrictor and is in “flush mode,” if the handle is perpendicular to the valve then the unit is ready for normal use. Used the 800 ML Flush as recommended for a 100 GPD Membrane and the water pressure dropped too significantly to push any TDS out. Had to return it and use the capillary style and everything works fine. Drop in pressure is now acceptable and still flushes out the TDS. Gave this 2 stars because it's a clean and simple product, but the ratings need to be changed. Works as expected and is not noisy as some other reviewers have said. Installed it has a very faint sound like water is running when in use as a flow restrictor (that's normal). It's actually noisy in flush mode so you're not going to forget it and waste massive amounts of water (that's a good thing). Overall it's a great two in one product. Would have been nice not to have to reasearch how to install this. I built my own RODI system by buying all the canisters, filters, membrane, housing, pressure guage, auto shutoff kit and this manual flush valve all separately here on BRS to save money over buying a pre-assembled unit. There are 2 issues with this Flush Valve... First, it makes a loud air sound when you close the flush and use it with the restrictor in place to make your water. VERY ANNOYING! Second, and more importantly, this flush valve will not work properly with the Auto Shut Off Kit that I also purchased here on BRS. I got the valve for a 150gpd RODI system, the 800 mL. I have a ball valve that is connected right outside the garbage pail where my product water is stored so I can close off any water going into the pail when flushing so it all goes out the waste water line. For some strange reason, when the ball valve is closed, allowing no water to the pail, and I start to flush the membrane, too much pressure builds up in the line and after about 10 seconds and the Auto Shutoff Kit kicks in and shuts off the water completely. After calling BRS about this, they said the only thing I could do was to slightly open the ball valve, alowing flush water into the pail. I've tried the Flush Valve from Marine Depot and it also makes the Auto Shutoff kick on, but only after 5 seconds. So the BRS valve stays on a bit longer. The only thing I can think of is that I have 60psi of water pressure straight out of the tap, without a booster pump. With a restrictor it jumps to 80psi and pumps water fine. But the Auto Shutoff Kit kicks in when flushing, with the pail's valve closed, when it hits 60psi. I guess there's too much water pressure backing up through the waste water line. So if you have naturally high water pressure, like I do, none of these manual Flush Valves work with the Auto Shutoff Kit if you close off access to your storage container. But if I remove the Flush Valve and close off my container, the system pumps all the water out the waste line, albeit with a flow restrictor inline, and the Auto Shutoff never kicks in. So even though the Flush Valve is completely open to flush, it still is restricting water flow slightly, or the ASO wouldn't interfere. So between the noise and the ASO Kit problem, I wouldn't advise getting this if you have a setup like mine... a standard 3-canister and 1-150gpd membrane with the ASO Kit installed. The on/off flush value seems to be a better design. The longer turn value is easier to turn. A bit noisy fir the first 30 seconds, but then operates silently. Easy to install! As always, BRS staff pointed me to exactly what I needed and was simple to install. Thanks! I got this to be able to flush my RODI System. However when it is acting like the flow restrictor, it is pretty loud. Not sure if mine is defective but oh well. other than that it works fine. I prob. could have contact BRS but figured it is what it is. I got this to be able to flush my RODI System. However when it is acting like the flow restrctor, it is pretty loud. Not sure if mine is defective but oh well. other than that it works fine. I prob. could have contact BRS but figured it is what it is. I recently purchased BR6 and decided to add the flush valve. Installation was very simple - I just had to remove the existing flow restrictor and insert the flush valve. Removal is simple because you simply push in on the collar and the tube can be pulled out. This kit was very easy to install also easy to use the only downside is brs recommendation is to flush before and after which is hard to do if you have a auto shut off you can flush before just turn it to flush then remove your ro water it eill then flush and you can turn it back to make water you can't flush after due to the auto flush when its engaged it will not alllow any water threw. Hello, I have a 24GPD older Kent unit. Can use the smallest of the valves to flush this unit? Great question! The 400ml flush valve will work great! I have the 75 GPD 5 stage + RO/DI unit and I am adding the BRS 150 GPD Water Saver Upgrade Kit. 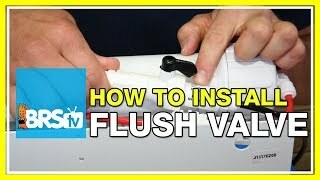 What is the correct size membrane flush valve I need for my system with the addition of the extra membrane? That's a great question! You will continue to use the same 550mL flush valve/flow restrictor that you would with the single membrane, so no need to purchase anything new! Ok i give i have been looking for an hour and cant find any info on how to install this. Would have been nice if it would have been included in the shipment. Does it go on the waste water? I have better more important things to do than waste an hour on this. What a joke! The Membrane flush will be installed on the black waster water line exiting the membrane. This contains the flow restrictor and flush valve all in one and will be the only item on the black waste water line before the water enters the drain. I have a BRS 5 stage 75GPD RODI unit with a 550mL flush valve and a booster pump kit. My tap water is very dirty (700+ TDS) and I'm getting around 50 TDS after the membrane. I was wonder if got a bigger flow membrane flush valve if that would increase my rejection rate? or is the 550mL the biggest one I can get for my 75GPD unit? You could try a larger flow restrictor, but honestly we would suggest giving a precision needle valve a try. For systems that need to be tuned the needle valve is the best value, instead of trying a bunch of different restrictors. Just replace your current flow restrictor with the one in the link below, and it does take a little bit of time and patience, but tuning them is pretty simple. Just slowly start closing the needle valve. You will see your water pressure react to the changes too, and by monitoring your TDS meter and pressure gauge, you should be able to find the best restriction point for your specific water. My output runs to a storage container in the garage. When in flush mode does water exit the output line? If so is this bad water? Thinking of adding this to an existing RO/DI system that does not have it, and I really like your inline design integrated with the flow restrictor that exits to the drain line of the sink. Also what size would be appropriate for a unit that has a 120 GPD membrane? When in flush mode a small amount of product water will still trickle out however most of the water will bypass and be sent down the waste water line. The 600 mL model will send more water to the RO membrane producing more water of slightly less quality, the 800 mL version will send more water down the waste and produce slightly cleaner water. Feel free to let us know if you have any further questions!